As the Sunburnt Saver, I would be remiss to not discuss summer skin tips. However, since this blog is mostly about personal finance (and career development, and sometimes fun ;)), I struggled with tackling this topic in relation to saving money. 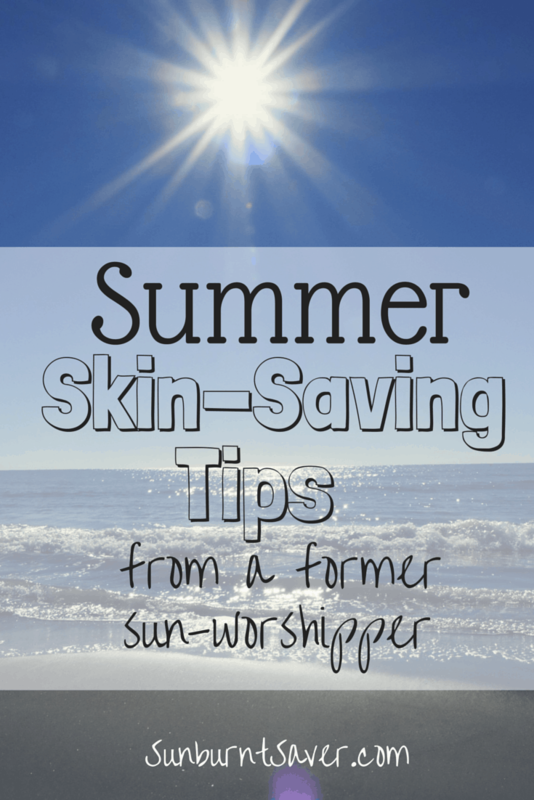 However, the bottom line on summer skin-saving tips is that protecting your skin now will save you a ton of money in the future. Read on for some summer skin-saving tips from the former sun-worshipper herself, me! Sunscreen costs money, but you know what costs even more money? Taking care of your skin after you’ve burned it a bunch of times. I used to spend a ton of time in the sun. You can read more on my bio, but the short version is I grew up with a pool and my Mom’s favorite vacation spot was southern California beaches. I would spend the majority of my summers in the pool or on the beach. I vividly remember dark purple sunburns on my chest, nose, back of my shoulders, and top of my legs. I had bright red sunburns on the tops of my feet. I wasn’t able to wear clothes sometimes because my sunburns were so bad (well, loose-fitting clothes, but even that hurt). It was terrible, and my parents even warned me about my sun damage. Did I listen to them? No. It wasn’t until my early 20s when I started going to a dermatologist that my sun habits caught up with me. I had multiple moles removed, and some came back as “atypical” (not necessarily bad, but not great). Each visit cost around $250, before I had insurance. After insurance, visits still cost around $25 plus mole-removal fees, which vary. I also pay for lab tests. I go to the dermatologist every 6 months, which means at least $50 a year goes to paying for past damage and bad choices. This does not include any money I have to pay for mole-removal or lab work. Right now, I’m okay. I don’t have skin cancer because I’m screened regularly. But you know what I do have? Scars from mole removals all over (luckily, most of them can be covered) and I’m already exhibiting sun damage on my face and chest. And yeah, I’m not even 30. It makes that $10 or $20 bottle of sunscreen look not so bad now, huh? Cover up! – Cover your face with a hat (that covers your ears, too), wear loose-fitting clothes to cover your chest, and park yourself under an umbrella. It’s not glamorous, and you won’t get a “sun kissed tan”, but those are so overrated anyway. Plus, that’s what tinted tanning lotion is for! The advice I’ve just given you is not only based on facts and recommendations from dermatologists. It’s also based on life experiences. I still remember a disagreement I had with an acquaintance about sunscreen. He is vehemently against using sunscreen because he believes the ingredients in most sunscreens are poison. His way of avoiding sunburns? Not going outside. Life is complicated and busy enough, and if the Banana Boat or whatever sunscreen you pick up at Target is what you and your family are going to wear, who am I to argue that you only buy this organic, short-shelf-life, very expensive sunscreen that you can only find online? One thing I can recommend, if you have the time and are curious, is to check out the Environmental Working Group’s 2015 Guide to Sunscreens. Some years, I’ll follow this guide to the letter and only buy approved sunscreens. Other times, I buy whatever is on hand on Target. What type of sunscreen you buy is up to your, your skin, and your budget. Personally, there are some EWG-approved sunscreens I can’t wear because they make me break out. Others I don’t buy because they’re too expensive (and yes, I know I just talked about the expense of dermatologists!) That doesn’t mean you don’t wear sunscreen – the generic brands you find at Target or Walgreens, I’ve found, work just as well as the pricey organic stuff. Until I moved to a place that didn’t get a lot of sunshine (the Pacific Northwest), I didn’t realize that some people didn’t have a regular sunscreen-application habit. Not all of you will need to apply sunscreen regularly, particularly during the winter months. 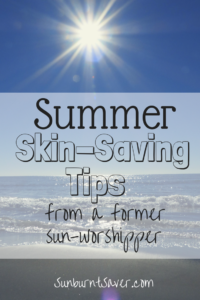 However, since summer is (un)officially here, I hope my summer skin-saving tips will come in handy for a lot of you. As the sun gets stronger and it stays lighter longer, really consider throwing on some sunscreen before you head out for the day. I promise it doesn’t take very long – and it will save you time, heartache, and definitely money in the future! What summer skin-saving tips do you have? Is there anything I missed that people should do? I used to get extremely burnt when I was a teenager. Now I’m smart like you. I never leave the house without sunglasses (even in the winter – white snow can be blinding!). I also wear a African safari looking hat and apply sunscreen to my hats and arms or wherever needs it. It’s all to keep my skin healthy – and I don’t like the idea of premature aging. Eeek. I don’t want to look like a catchers mit. Shout out to sunglasses! I love my cheap Target sunglasses. They don’t always fit well on my face, but they do the job. I totally agree with you about the snow, too. Until I lived in the snow, I didn’t realize how necessary sunglasses were. You basically need to keep sunglasses in every nook and cranny – car, purse, pockets, wallet (if they fit), utility drawer, bedroom. Random sunglasses, all the time 🙂 Because when you don’t have sunglasses and are going blind from bright sun (or sun reflection), it’s THE WORST. Gasp, this is such a much needed reminder for me. I never reapply my sunscreen even though I apply it religiously every morning :/ I really should carry a tube around with me everywhere I go. Even if you just carry a small one and reapply when you go outside, it probably doesn’t hurt! Although if you wear make up, many make up products offer a small amount of protection against the sun. It depends on how much you’re out – if you go out for 15 minutes to walk to lunch, it’s probably okay. But 1 hour sitting in direct sunlight? Yup, time for a new application! Good advice! I think one thing people forget is that you can still get burnt when it’s cloudy out, and sometimes even more so! I’ve made SPF part of my daily routine. That’s a great point, Heather! A lot of people think when it’s cloudy out, or if there’s snow on the ground, they don’t need sunscreen… but you can still get burned, no matter what the temperature outside! That’s interesting to know that SPF doesn’t matter as much as reapplication. I’ve always gone for the sunscreen that’s the highest SPF I can find. I will have to change my tactics and just reapply it more often! Thanks for the tips on how to help your skin during the summer months. I have Scandinavian heritage, so my skin is especially sensitive to the sun. I also have a history of skin cancer in my family. You make a good point about how taking care of your skin can save you money. Your skin is the largest organ of your body. It’s always a good idea to try and protect and take good care of it. Summer sure is both a fun and frustrating season. You’ll just burn your skin or dry it up under the sun. But fortunately, these helpful tips will be effective to ensure that your skin won’t get sunburn. Protecting our skin could not be that hard when it’s hot. Just don’t forget to use SPF to ease your summer weekend.